Personally, I’d have gone with a big-screen TV on that wall. Among the challenges of travel is how to apportion the limited time one has at any given destination. It’s simply not possible to take in all the attractions of Paris or Yellowstone in one day, while one hour may be plenty for Death Valley in August. Most of us assign priorities before we go: “For sure I want to see the Statue of Liberty, and Central Park, and Times Square.” That’s good planning, unless your trip is actually taking you to Honolulu and not to New York. Or let’s say you have some discretionary time in Philadelphia. You’ve taken in Independence Hall and the Liberty Bell Pavilion; a short walk will take you from there to another memorial operated by the National Park Service. You’re probably way ahead of me — yes, I’m referring to the Thaddeus Kosciuszko House. As you know, he was a Polish-born general who fought on the Colonials’ side in the American Revolution. It’s a nice little house in a nice little neighborhood, and it is absolutely tourist-free. Try to open the front door as gently as possible so that you don’t startle the NPS ranger at the front desk; he’s not accustomed to seeing other human beings during his work day. If you ask nicely, he will tell you how to pronounce “Kosciuszko”. One could spend months in Rome without seeing all that the Eternal City has to offer. When I’m there my impulse is to sprint from one attraction to the next, and I’ve managed to take in many wonderful sights… and a very strange one. On Via Veneto, near Piazza Barberini, is a church called Santa Maria della Concezione. 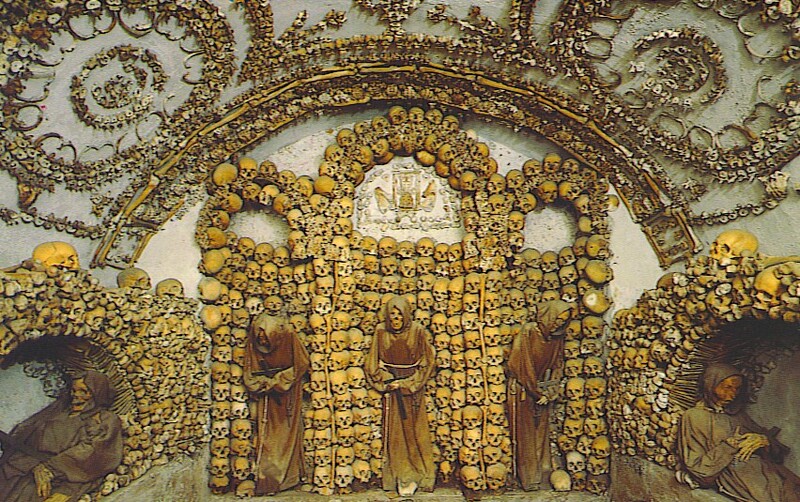 Tucked under it is a macabre crypt that is filled with some 4,000 deceased Capuchin monks, their bones on “artistic” display. There are several chambers: one is known as the Crypt of the Skulls, another is the Crypt of the Leg and Thigh Bones, yet another is the Crypt of the Pelvises. You can imagine what is in those rooms, but you probably wouldn’t have guessed that these bones are nailed to the walls in complex patterns. I also seem to recall there being some bones that had been made into lamps. The Convento dei Cappuccini is not considered one of the main attractions of Rome, but trust me — it’s one you’ll remember for a long time. Especially if you stop in at the little gift shop and pick up a souvenir. Any other suggestions of unusual places to visit, after we’ve seen the highlights? What is there to do in, say, Rüdesheim, Germany, after you’ve been to the Music Box museum? This entry was posted in Travel and tagged Santa Maria della Concezione, Thaddeus Kosciuszko House. Bookmark the permalink. Bogota’s Museo del Oro (Gold Museum) was a pleasant surprise – over 33,000 gold artifacts from pre-Hispanic times. Only 20 people are allowed in at a time for security reasons, but we had no wait. Pretty accurate description of the “Ka-Shoo-Sko” house. We visited there recently to research a travel book about Philadelphia and think we did startle the Park Ranger. The house has recently been renovated and one of the highlights is choosing to hear the historical narrative in English or Polish. Perhaps the only NPS site with that option.